This is an article I wrote on percutaneous angioplasty. At the bottom of the page are several other things for your viewing pleasure. They are executable digital book files and run in DOS mode. They download as self-expanding zip files to save time. Angioplasty and a Lesson from History. Percutaneous transluminal angioplasty was first purposed and attempted on peripheral vessels in 1964, using a coaxial system of dilating catheters. By the 1970's balloon catheters where being used to treat both peripheral and coronary vessel obstructions. Per percutaneous transluminal angioplasty (PTA) and percutaneous transluminal coronary angioplasty (PTCA) has been shown to be a valid and useful treatment alternative in patients with obstructive arterial vessel disease. Patients should be considered candidates in the presence of arterial disease resulting in significant symptoms that have failed to respond to appropriate medical treatments. In the case of PTA, on most common is claudication and/or reduced exercise tolerance caused by stenosis or occlusion of one or more peripheral vessels. For PTCA the most common symptom would be angina pectoris unresponsive to other treatments. The effectiveness of treatment with angioplasty and patient outcomes in both long and short terms is greatly affected by proper patient selection. As stated previously patient should have symptoms significant enough to consider an intervention, with the associated risks, as necessary. The affected vessels should be anatomically suitable, lesions in tortuous vessel segments present an increased risk for dissection following balloon dilatation. The nature of the stenosis or occlusion should also be considered when considering angioplasty. The type of lesion has a direct affect on the likelihood of a successful outcome. Membrane/diaphgram like lesions, as well as short segment lesions are resistant to dilatation and require high pressure balloons for successful angioplasty. Calcified lesions are also resistant to dilatation and present an increased risk of dissection at the treatment site following Percutaneous treatment. Attempts to dilate asymmetrical lesions can result in suboptimal expansion of the lesion and/or dissection of the unaffected vessel walls at the treatment site. Lesions in tortuous vessels, at bifurcation, or at the origins of branch vessels also present special problems and increased risk of complications to be considered. The length of the lesion in relation to the length of the balloon used affects the outcome in both PTA and PTCA. The incidence of hemodynamically significant dissection increases as the length of the lesion beyond the length of the balloon increases. 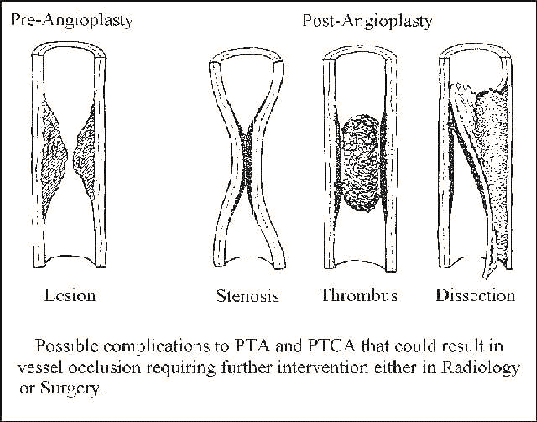 Patient undergoing both PTA and PTCA should be evaluated as candidates for surgical intervention either due to failure of angioplasty or the development of complications during or following the procedure. High quality angiographic evaluation of the vessel(s) being considered for angioplasty in a vital perquisite for lesion location and evaluation in both peripheral and coronary vessel disease. Early patient selection criteria for angioplasty was limited to patients in otherwise good health with readily accessible, uncomplicated disease. As techniques and equipment have advanced over the years patient selection criteria have relaxed to allow percutaneous intervention to be considered in a much broader range of patients. Multiple and/or eccentric lesion may now be treated successfully in both peripheral and coronary vessels with good patient outcomes in both the long and short terms. For PTCA patients with poor ventricular function are now considered appropriate candidates in some cases. Based on coronary angiographic studies of patients actively experiencing myocardial infarction demonstrating the active mechanics of occlusion, even these patients can benefit in some cases from percutaneous intervention. As the Egyptian physician said 4000 years ago, "this is a disease with which I will contend."